This tutorial explains you how to integrate the computer vision library OpenCV in the Dev-C++ IDE. Please note: this tutorial refers to the OpenCV version 1.0rc1. See the modifications at the end of this page if you like to use the newer version 1.1pre1! OpenCV (Open Source Computer Vision Library) is a C++ library from Intel for image processing. Dev-C++ is a open source development environment (IDE) for C and C++. 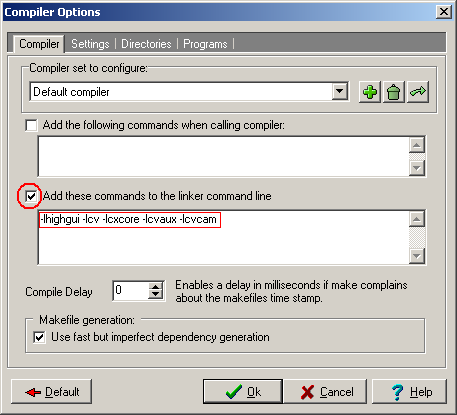 The IDE runs with Windows and uses a varaint of the GNU-C++ compiler. One of the greatest advantages is the clearly arranged user interface, which doesn't slow down your work with needless features and makes it easier for beginners to become familiar with it. In this how-to I will assume, that you already have installed Dev-C++ on your system. The first step is to download OpenCV from http://sourceforge.net/projects/opencvlibrary/. The version used in this tutorial is named "OpenCV_xyz.exe" and located in the package "opencv-win" (xyz stands for the version). Direct link to the download of version 1.0rc1 (16 MB), auf welche sich diese Anleitung bezieht. Now you must run the downloaded setup program. If you keep all default setting during installation (recommended! ), OpenCV will be installed to C:\Program Files\OpenCV. After the installation you'll need to reboot your system, due to changed path settings (C:\Program Files\OpenCV\bin). You will find some example programs in C:\Program Files\OpenCV\samples\c. Some of them require a connected webcam (or other video source) to work. 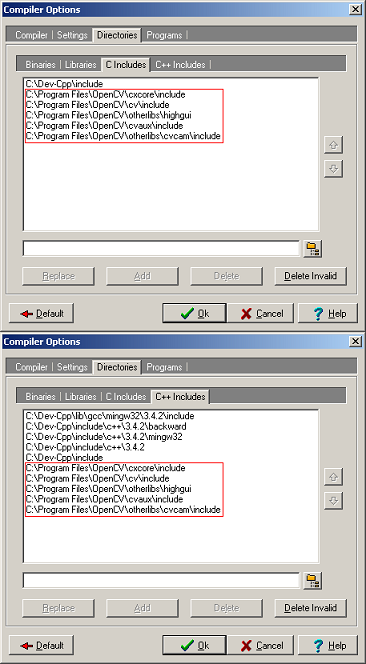 In Dev-C++ open the menu "Tools->Compiler options". Well, this wasn't too hard. Now you should be able to open a sample file - for e.g. C:\Program Files\OpenCV\samples\c\squares.c and compile and run it with Dev-C++ (F9). In the meantime there is a newer OpenCV version 1.1pre1 availabale on Sourceforge. 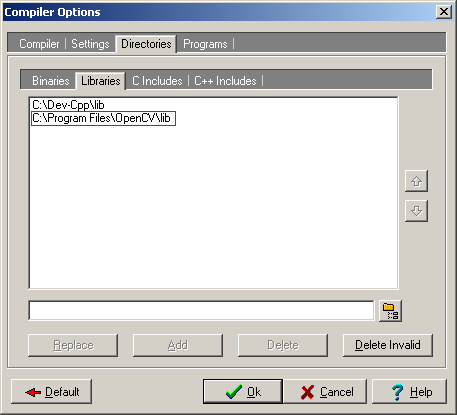 During installation of OpenCV you will be asked whether the path C:\Program Files\OpenCV\bin shall be added to the PATH environment variable. Please leave this checked (default). After installation you should restart Windows to accept PATH changes. When configuring Dev-C++ do not add -lhighgui -lcv -lcxcore -lcvaux -lcvcam to the linker command line. The correct phrase is: -lhighgui -lcv -lcxcore -lcvaux. Thus without -lcvcam! Do not add path C:\Program Files\OpenCV\otherlibs\cvcam\include to the sub-tabs "C Includes" and "C++ Includes". This path no longer exists with the 1.1pre1 version.